For a period of up to 5 hours gives the pet's hair a pleasant unobtrusive aroma. It facilitates combing due to the anti-static effect. It gives the hair a healthy shine and is good as a finish spray. The line includes 4 products with different flavors? 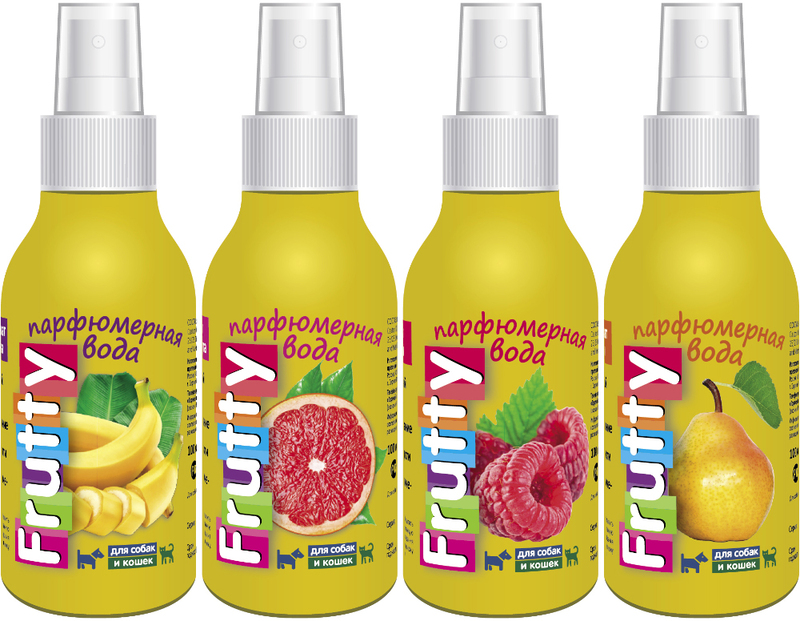 which are well known for our shampoos of the Frutty series, namely: the tropical aroma of the Jamaican banana, the fresh aroma of juicy grapefruit, the enchanting aroma of honey pear and the bright aroma of wild raspberries! Spray from a distance of 25-30 cm on the dry or damp coat of the animal. Avoid contact with mucous membranes and damaged skin. Use as needed. Keep in a place protected from direct sunlight. Shelf life - 2 years from the date of production. Polymer bottles of 100 ml with a spray head.